Most herds produce milk containing two types of beta casein, A1 and A2, however there is a small minority who are intolerant to the A1 protein. 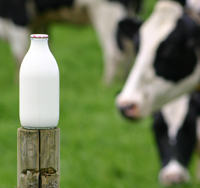 A2 milk is produced by cows genetically selected to only produce the A2 milk protein and this niche product has become popular in New Zealand and increasingly Australia, where it currently accounts for 6% of the market. In recent years there has been a push to retail A2 milk products in the UK, which has been led by Muller Wiseman Dairies.